Throughout our 22 years working in the high-end private residential market we’ve seen numerous examples of well-made cabinetry and bespoke kitchen furniture let down by their maker’s failure to get the finishing to match the standard of their making. This is not only a great shame, but avoidable. When specifying our new workshops in Somerset, great attention was placed on ways of improving the efficiency of our finishing, in particular period finishing. The key is in controlling the environment in which you finish, and while controlled environments are not cheap to create, they pay huge dividends in the end result. We’re proud of the environment we’ve created. Stretching at over 30 metres in length, the finishing booths housed in our 12,000 square foot cabinet-making workshop consist of four key areas. 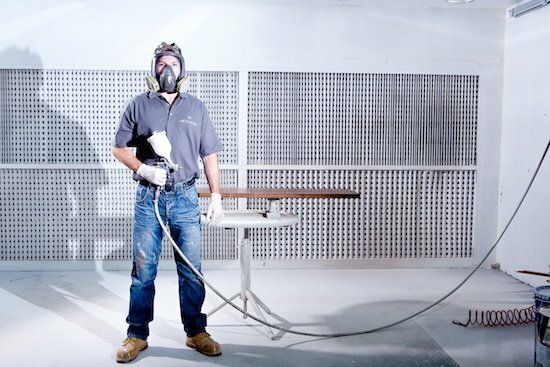 Artichoke’s environment controlled finishing plant enables us to deliver flawless finishes to furniture first time. 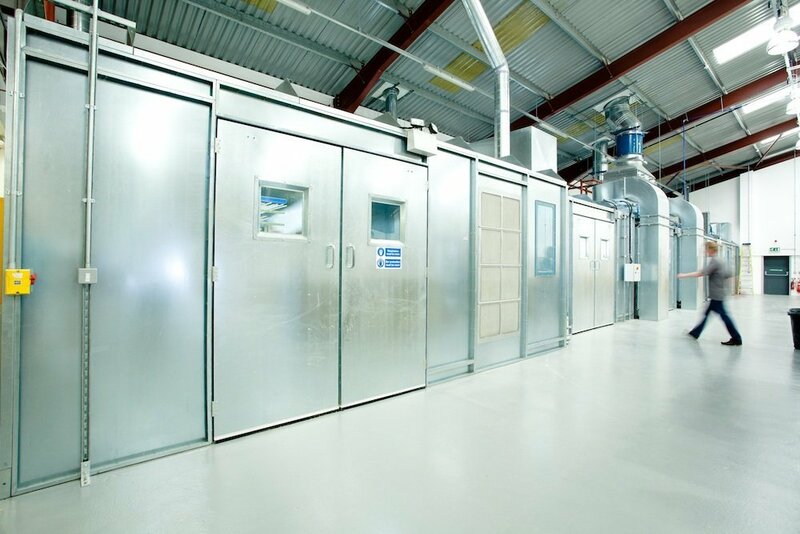 The environment within the spray room works on the same principles used in car spraying. Fresh air is sucked into the booth, which is then heated before entering the spraying chamber to give our finishing team the perfect environment in which to deliver the finish onto the furniture. The room itself works on negative pressure to ensure the environment is kept clear of dust particles throughout the process. Once the finish has been applied to the kitchen or furniture component, it is taken to the drying room through an internal doorway to avoid external contamination. This room also works on a re-circulated heating system, temperature controlled to provide the best environment for the finish to dry under its own steam. We do not force dry any of our finishes at Artichoke; force drying a finish will often result in what we call orange peeling, where a finish shrinks faster than it should during the drying process and the surface becomes rippled and uneven. This a fully enclosed chamber with filtered air inputs and two down-draft extract benches which remove sanded material into our external extraction plant. 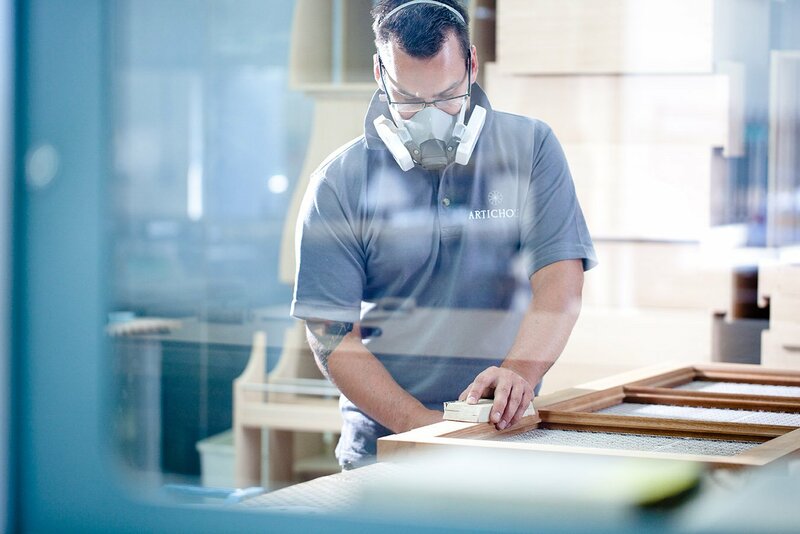 It is on these benches that Chris and his team either hand or machine finish furniture to its desired finish. Sanding a cabinet door for a Georgian library before it goes into finishing. This is the largest of the four rooms, allowing numerous kitchen and furniture components to be laid flat before a hand paint finish is applied. All of our painted furniture projects are hand-painted in the traditional manner and to the highest possible standards. All hand-painted furniture requires a clean and controlled environment and this room also has a filtered air input and heating system to provide control over the air quality and temperature. Currently the heating to these rooms is generated via a gas-fired system although plans are afoot to add an additional wood-waste fuelled boiler plant.